Coming up with blog content ideas can stump anyone and drain your enthusiasm about maintaining a blog. After all, how many blogs have you visited that are here today and abandoned tomorrow? Rev up your writing with 101 blog content ideas for your mom blog that get your inspiration flowing and keep you excited about blogging. Tell your blog's story, from the idea of starting one to how it's evolved since you wrote your first post. Confess your biggest parenting failure. Boast about your biggest parenting success. Turn a negative comment into a positive post. Unite with another parenting blogger to write a point/counterpoint blog post each week. Write about your favorite "me time" indulgences. Share your personal story of helping kids through a difficult situation (death, divorce, etc.). Explain why you post pictures of your kids on the internet or why you don't. Let your child write a guest post on your blog. Create a top 10 list of your life achievements so far. Make a list of the people you dated before you got married. Write a humorous post on why each person wasn't "the one." Pick a worthy cause or charity and write your views about it. Tell your readers why you want another baby (or don't). Log how much time you spend a week writing and maintaining your blog. Write your child's birth story. Describe your best day as a mom. Describe your worst day as a mom. Post a picture and ask readers to caption it. Share a dilemma that's plaguing your family right now. Rehash your first trip to the emergency room with your child. Tell your in-laws exactly what you think of them (as long as they don't know your blog!). Read the latest weird news and write your own post about it. Admit something you said that your kids shouldn't have heard. Start a weekly feature (on a hobby, cooking, or another niche topic). Write about your blogging inspiration. Show off your tattoos or tell everyone why you never got one. Document a DIY project (painting your kids' bedroom, de-cluttering your closet, etc.). List your top 5 favorite activity ideas for kids. Review a baby or children's product you own. Expose a secret family recipe. Post a picture of your child next to one of yourself at the same age. Ask others to identify the resemblances. Gather your mom friends and host a once-a-month podcast for parents. Tell why the world would be a better place if a mom was in charge. Carry your camera with you at all times. Post a funny picture of the week. Pose a poll question. Follow up with a blog post announcing the results and your views on the findings. Search the Internet and write a "best of the blogs" post for moms. 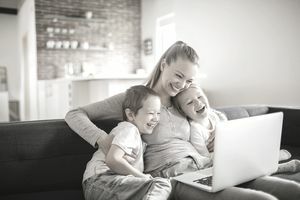 Explain how you use Twitter to connect with other moms or why you don't. Find out what the number one pop song was 10 years ago today. Write a post based on the song's title. Take an expert's stance on a topic and field questions from your readers. Feature your best blog comments of the week. Look at the list of popular posts on other blogs moms write and share your own opinion on the topics. Keep track of holidays, events, and other observances throughout the year and blog about them. Tell others why you chose your blog design. Pick a celebrity mom you identify most with and explain why. Take a stand on a controversial parenting subject, such as breastfeeding vs. formula feeding, spanking, etc. Write a post about why you work outside the home or why you don't. Explain why your blog rocks. Host a contest or giveaway. Log your child's birthday party, from planning all the way to the big day. Write about why you love blog memes (or hate them). Make a list of bloggers you'd like to meet. Link to them and send them a note about your post. Share your reasons for choosing traditional school vs. homeschool or vice versa. Write a post with tips on how you protect your kids from bullying. Tell a story by posting pictures. Share freebies and good deals. Create a quiz for your readers. Post the answers at the end of the week. Give your take on the hot parenting news story of the day. Share what you've learned from blogging. Apologize to someone from your past. Dissect the pros and cons of being a mom today vs. being a mom 50 years ago. Write a brief memoir as a blog post. Name 10 wishes you have for your kids. Confess your spouse's dirty little secrets. Explain what you hope to accomplish in 20 years. Share your kids' latest antics in a post. Write about your favorite road trip. Tell a true story about your parents. Get a free makeover. Describe your day and post before and after pics. Compare your childhood toys to your kids'. Relive some of the things your kids do that remind you of yourself as a child. Chronicle a day in your life with lots of pictures. Write about a really great idea you had that turned out to be a total bust. Share your favorite family traditions. Tell your story of loss and how you got through it. Write about your best moment of the week. Write about your worst moment of the week. Post a picture of yourself in high school and tell others about that year of your life. Look at Google's trending topics and write a post based on what people are searching for right now. Create a best of the year list, such as the top stories for moms, top products of the year for moms, etc. Check your spam box or junk mail at home. The crazy offers you get make a great post. Write blogging tips for newcomers. Predict where parenting bloggers will be in 10 years. Celebrate your blog's milestones - its birthday, your 100th post, etc. Write an FAQ about yourself. Tell everyone why you ignored a friend request on Facebook. Share your tips on how you balance family life with your time online. Explain why you're a PR-friendly blogger or why you're not. Start an award and hand it out every week to other bloggers. Write about your first love (a boyfriend, car, pet, etc.). Pick a project - losing weight, running a marathon, starting a business. Document it. Encourage would-be bloggers to stop lurking and start blogging today! What is a Blogging Platform and Do You Need One for Your Business?